The ground fault detector (GFD) is an appliance specifically developed to detect a ground fault current on the 15 KV lighting station arteries of a rail network. Ground fault detection electronic relays for 15Kv HV cables on a rail network. 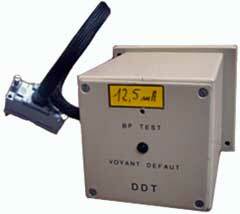 The detection threshold is adjustable, the usual values are 30mA or 12.5mA. Detection is completed by a LED indicator, a push button on the front face can be used to simulate a fault.